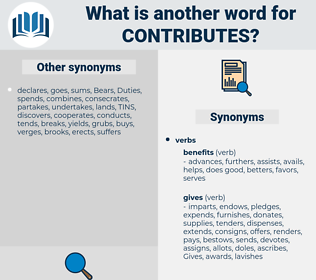 What is another word for contributes? 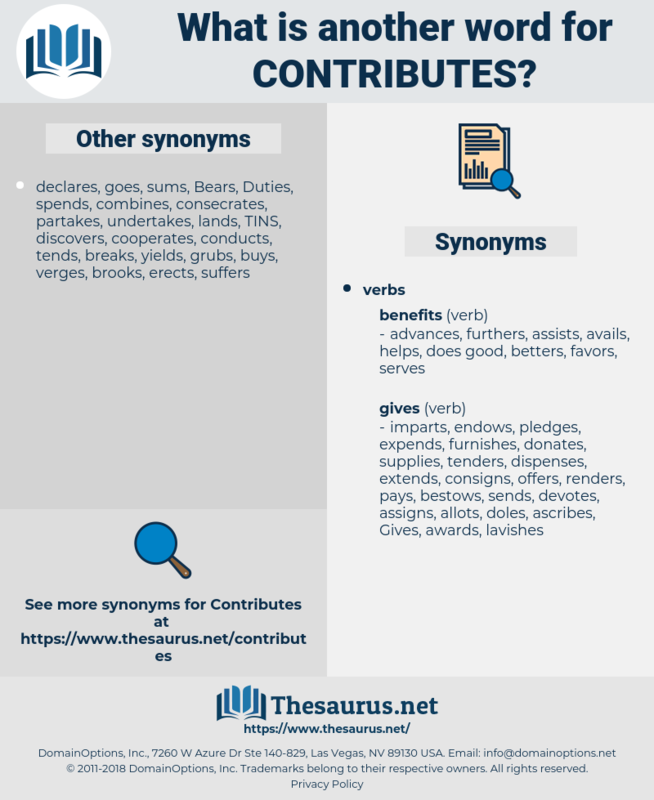 contributors, benefits, Communities, results, objectives, products, advances, fuels, accounts, pledges, Efforts, Gains, Activities, supports, contributions. assisted, involved, Served, leveraged, played. collaborate, collaborates, constitutes, cooperates, conducive, incorporates, encourage, encourages, Facilitating, facilitates, concentrates, exacerbate, exacerbates, factor, factors, stimulated, stimulates, corresponds, complements, consolidates, promotes, generates, reinforces, competes, create, creates, integrates, commits, contributors, incurs, invites, furthers, interacts, aggravates, confers, subscribes, continues, foster, fostering, indicates, illustrates, responsible, represents, co-operates, contains, consists, translates, writes, advocates, belongs, comprises, induces, enriches, Guarantees, empowers, equates, dedicates, Affects, confirms, accommodates, brings, potentiates, distributes, worsens, completion, obstructs, prefers, demonstrates, contends, bolsters, conducts, influences, involves, exists, improves, introduces, denotes, responds, devotes, enhances, informs, broadens, hinders, invests, perpetrates, conveys, underpins, implements, renders, intervenes, cultivates, presents, sustains, enables, accountable, strengthens, produces, augments, nurtures, deepens, relates, reflects, boosts, covers, complies, accompanies, impairs, occurs, leads, engages, submits, Lends, forwards, undermines, opens, Comes, advancement, disburses, counts, joins, nourishes, protects, foments, attends, provide, embodies, directs, entails, exerts, favours, impedes, reports, reduces, becomes, recognizes, serves, encompasses, undertakes, inhibits, increases, spurs, stipulates, heightens, provokes, monitors, intensifies, furnishes, operates, outlines, sponsors, embraces, includes, is, endorses, enters, diminishes, elicits, underscores, authorizes, offers, purports, oversees, receives, ensures, depicts, Permits, retains, accepts, explains, hampers, impact, IMPACTS, tends, insures, authorises, proceeds, describes, fulfills, entrenches, expands, prevents, erodes, fulfils, occupies, shares, Bears, remits, incidence, source, arouses, finances, earns, advises, transmits, imposes, develops, equals, yields, identifies, impinges, upholds, assigns, attracts, pursues, teaches, SITS, extends, entitles, profits, compounds, emits, element, proposes, determines, achieves, feeds, strives, registers, discloses, poses, appoints, Securing, secures, sends, intends, thanks, allows, broadcasts, transfers, amounts, appears, deposits, affords, implies, causes, understands, Addresses, builds, performs, signifies, agrees, adds, favors, emphasizes, refers, proves, works, enshrines, pours, leverages, underlines, spends, discusses, allots, breeds, origin, Exercises, harms, weighs, establishes, manages, Replies, benefits, relies, expects, maintains, portrays, supplies, imports, accords, affirms, attaches, tightens, fits, issues, sets, pushes, Canadians, drafts, Communities, divides, Drives, stresses, part, asserts, simplifies, expresses, Leaves, assures, answers, argues, Plays, stands, amends, wears, highlights, raising, raises, prepares, realizes, Carries, results, aims, grows, fosters, applies, reveals, lies, aligns, seems, framework, clarifies, game, respects, rises, fails, matches, takes, spills, places, Gives, alleges, seeks, speaks, lists, sees, funds, flows, means, believes, puts, eases, Backs, Rests, Has, runs, lays, assumes, shapes, Focuses, displays, shifts, shows, falls, releases, holds, advances, meets, Strikes, fuels, marks, accounts, deals, uses, lets, Forms, gone, goes, passes, keeps, Grants, looks, pledges, claims, acts, Does, attempts, says, party, sheds, gets, makes, Activities, 's, pays, awards, support, supporting, supports, contribution, contributions. center bit, Centre Bit, contrived, counterfeit, countrified, countryfied.